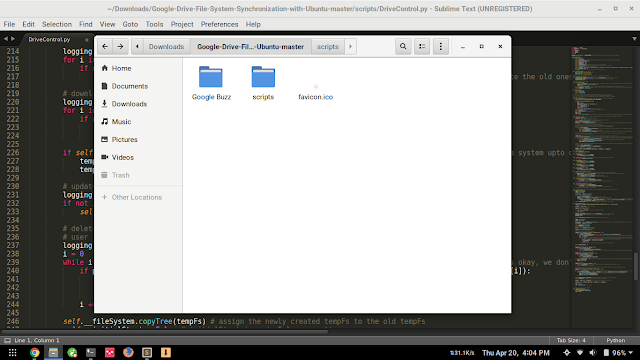 "Google-Drive-File-System-Synchronization-with-Ubuntu" is a new app (set of scripts) that synchronizes your Google Drive files with Ubuntu's local file system. Developed by Tanvir Islam, the app is based on Python's PyDrive library. It looks for changes in your local file systems every 10 seconds and synchronizes them with GDrive (and vice versa). To install the app in Ubuntu, download zip file from here and extract it. Inside the extracted folder, you will find a scripts directory. Open a terminal in it and run the command below to launch the app. You will be prompted to authorize the app in your browser. After you allow access to GDrive, the app will start syncing data in the folder we extracted in first step. You can add the above command (with full path to __main__.py file) to your startup applications to automatically run it after a fresh boot. If you don't like 10 seconds limit, then you can modify the source in DriveControl.py file and change the time to suit your needs (basic Python knowledge required).